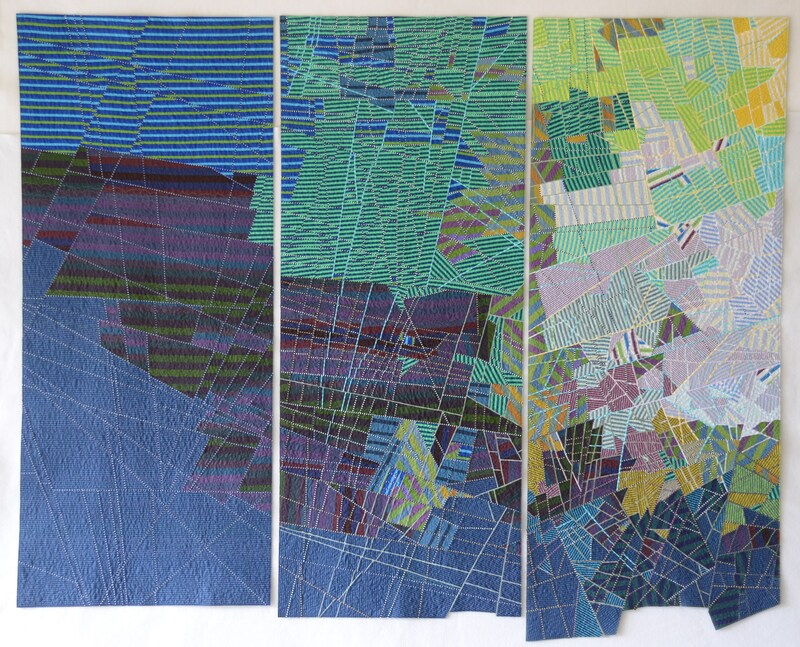 Martha Sielman is not only the amazing leader of SAQA, but she is also the editor of many amazing art quilt books. You can find a complete list here. 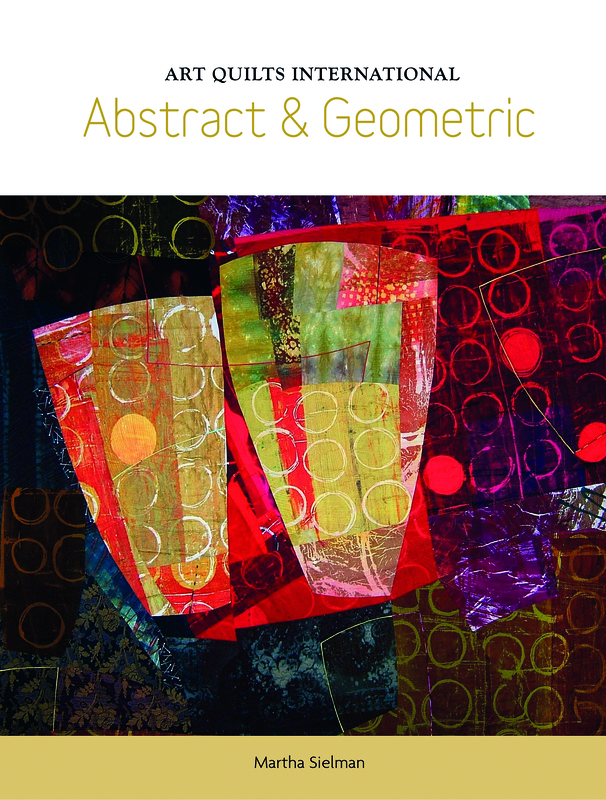 This past winter, Martha’s latest book Art Quilts International—Abstract & Geometric was released by Schiffer Publishing LTD. It is a beefy book with loads of eye candy. I must admit I had never thought of words as being abstractions, but they certainly are. Sielman says, “Written words are probably the ultimate abstraction: we use a system of symbols (letters) to represent sound and form words, which represent complex concepts and ideas.” Now that is something I can spend my weekend thinking about. 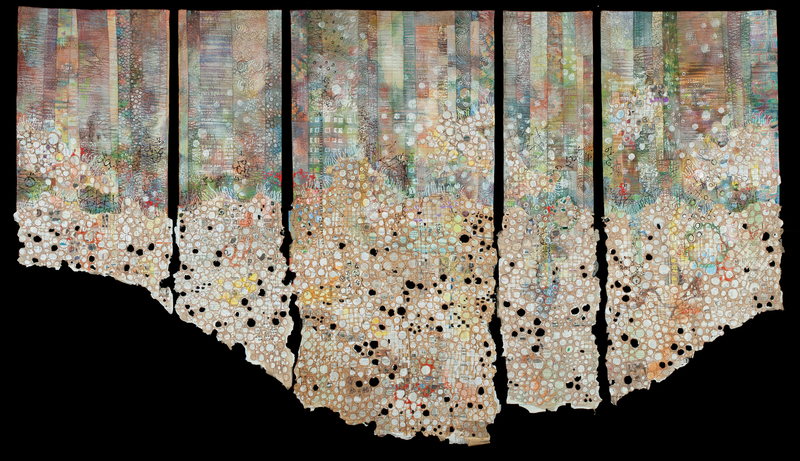 The full of array of media being used in abstract art quilts is also explored. 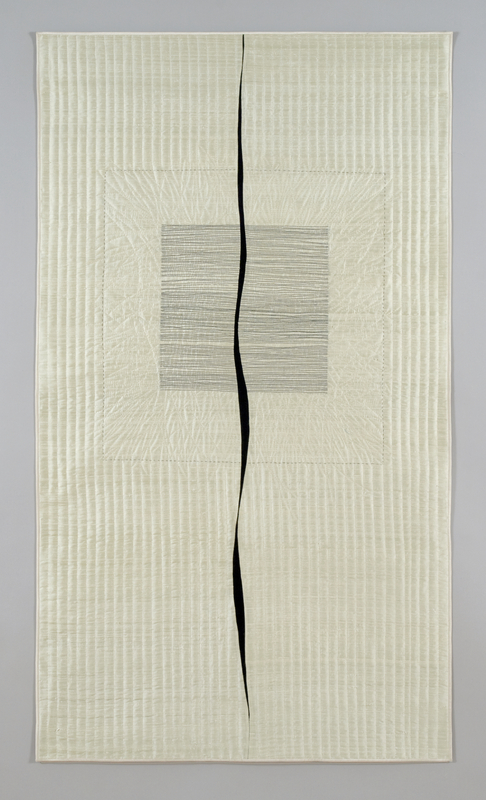 From traditional materials such as thread and quilter’s cotton to usual resists, paper, and beyond. In addition to the 300 pieces of artwork in the book, there are 29 in-depth artist interviews. 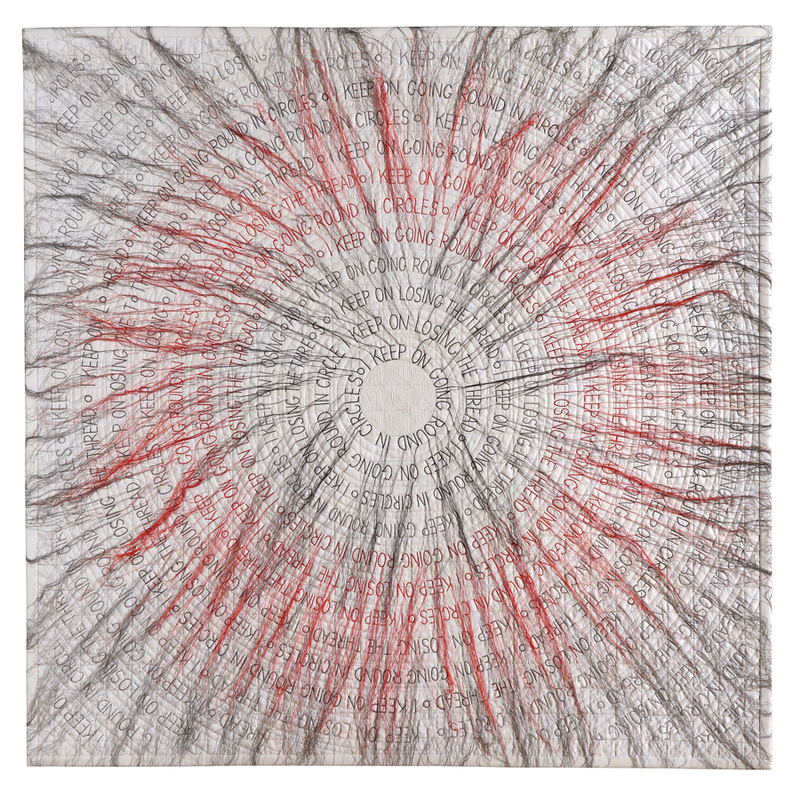 The interviews are an exploration of each artist’s inspirations, working methods, and challenges. 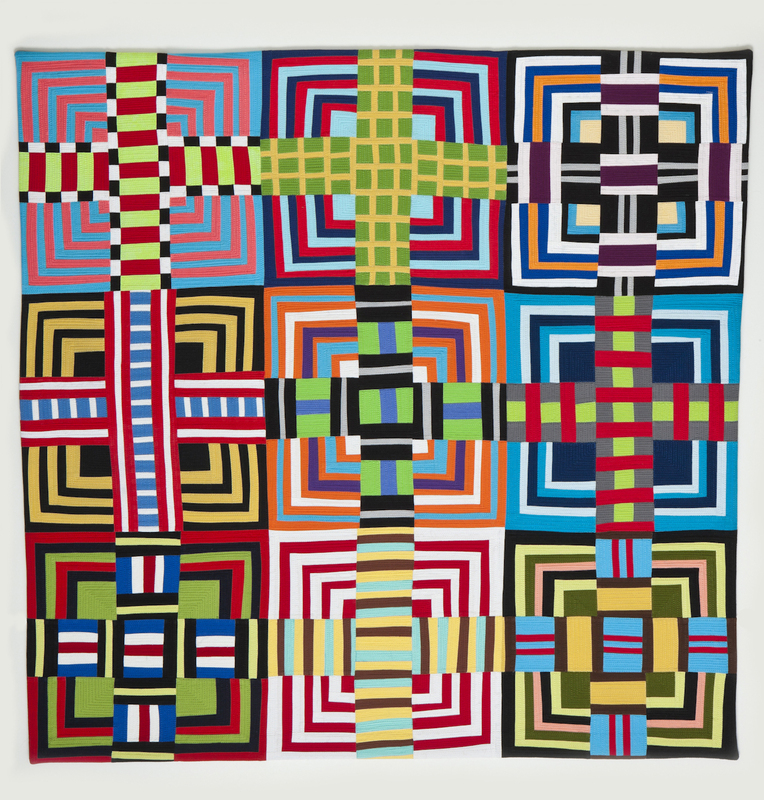 Sielman reviewed 1,300 quilts from 461 artists to curate her book. In the end, she selected 124 artists from 18 countries. Two of those artist live in Anchorage, Alaska. Diane Melms and me. Sielman selected Dance Party at Tamara’s House. It is one of my favorite pieces and I am very honored to say that it is a part of this book. 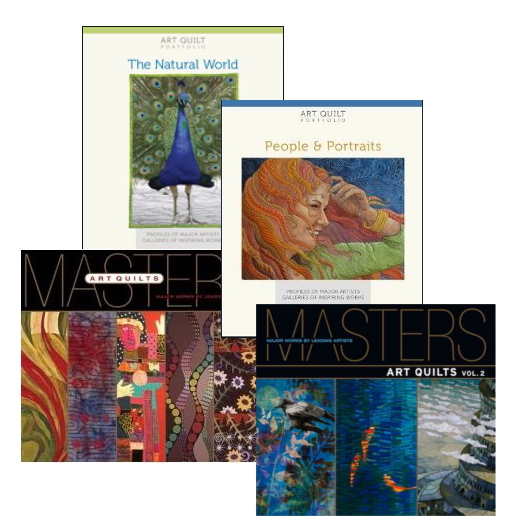 If you purchase the book on the SAQA website, you will get 5 art quilt notecards and 45% of your purchase price benefits SAQA aka the Studio Art Quilt Association. 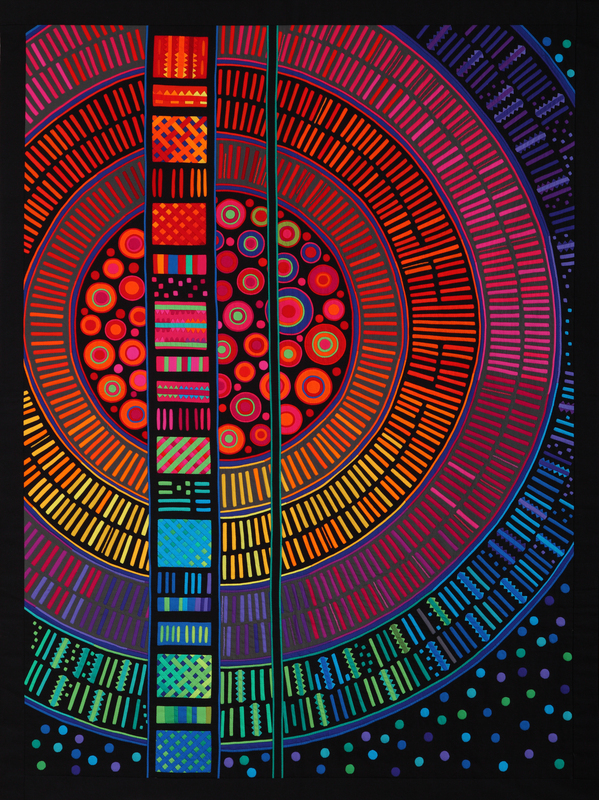 Here is a collection of close-ups of Dance Party–click on the images to get a closer look at the thread work. If you aren’t a member of SAQA you should seriously think about joining. It is an organization that celebrates the quilt and its makers through advocacy, exhibitions, education, and community. 04 Mar	This entry was published on March 4, 2017 at 2:58 PM. 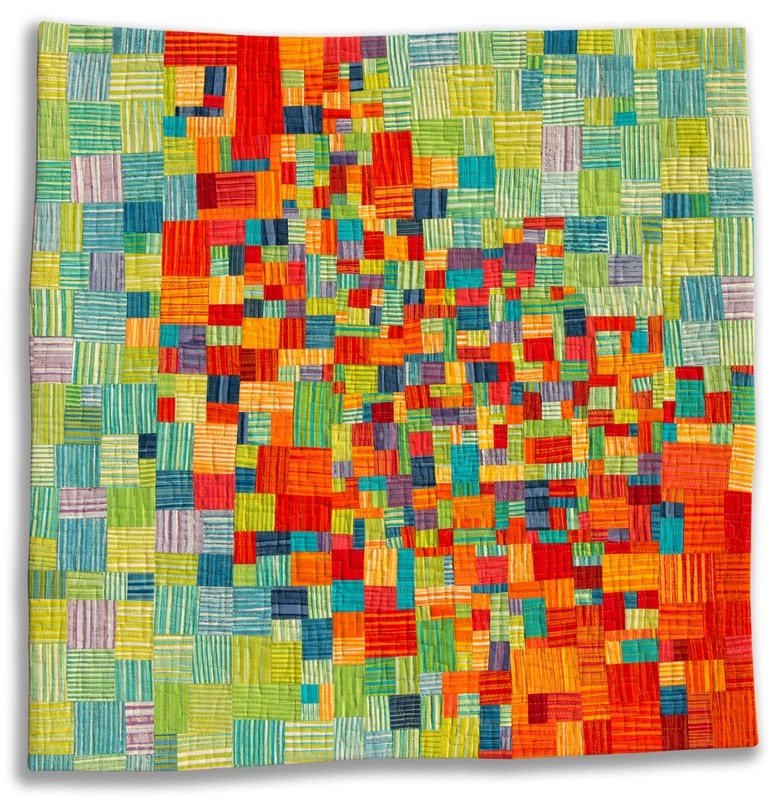 It’s filed under News And Events and tagged Art Quilts International--Abstract & Geometric by Martha Sielman, Dance Party at Tamara's House, Daphne Taylor, Deidre Adams, Diane Melms, Fumiko Nakayam, Kathy Loomis, Sara Impey. Bookmark the permalink. Follow any comments here with the RSS feed for this post. I’m glad you’re getting recognition. You deserve it! Wow, all are absolutely beautiful! Justine, the book really is beautiful and the interviews are great too. It is book worth having. I have all of Martha’s books! Yummy eye candy, not caloric and worth buying Martha’s books that will last a lifetime. Thanks, Maria for introducing all of us to these. Good points about the low calorie value of the book. Thank you Carole! Congrations for being in the book! It looks like you are in amazing company! Thank you Carrie. And you are right! There are some amazing artists featured in the book.